Brain scientists say that in “real life” we usually learn more than one thing at a time. And we often learn something using more than one sense at a time. Learning more wholistically, rather than artificially separating each subject, aligns better with the way our kids’ brains naturally learn. So logically, children learn better when we integrate subjects naturally and add multisensory learning. And when we add a strong emotion when we’re teaching… it makes learning even more effective. Integrating subjects is a popular way to teach now in public/private schools, but it’s a laborious project because there are so many teachers to have to get together on what will be taught in all the classes. Fortunately, with homeschooling this is easy. Since we’re teaching all the subjects, all we must do is put them together, or better yet, choose a curriculum that does it for us. The goal is to integrate subjects for easy multisensory learning to get the most out of the way your students’ brains are wired. So how do we do this? Instead of learning subjects separately, we put them together in ways that make sense. And it not only makes learning easier, it makes it more natural. And more engaging. And when we do it using as many of the senses as possible, including a strong emotional element, our kids learn, remember, and enjoy school more. Win-Win! What does subject integration for easy multi-sensory learning look like? I’ll give you an example from our homeschooling. Here’s how we spend one day: We started the academic part of our homeschooling day continuing our study of Ancient Rome. I made some brief introductory (priming) comments, and asked a few questions. We recalled how the Ancient Roman Republic eventually grew into the Roman Empire, while we looked at a cookie dough map made by my middle schooler showing how much land that the Empire had conquered and now occupied as of about 30 A.D. Comparing the time frame with the United States really brought the longevity of the Roman Empire home to my children. This is also called “priming” in brain-based teaching language–connecting something they already know with something they are learning. Then we talked about Bible history – New Testament history, particularly, and how Jesus was born during the Roman occupation of Hebrew lands. While we talked, we snacked on bread with olive oil or honey, cheese, olives, figs and grapes. We ate from an intricately-designed, colorful plate with a Greek motif that was a gift from my parents who had once traveled there. After our conversation and snacks, we moved to the sofa and got comfortable before continuing our read aloud: The Bronze Bow, by Elizabeth George Speare. This is the exciting story of an angry young teen who’s only goal in life is to avenge his father’s death and rid Israel of the hated Romans. Back to our day. While we were reading, I reminded the kids to be thinking about choosing a scene out of the book to dramatize by the time we were finished. At another time during our study of this historical period, we looked at Roman statuary and architecture and sketched the three different types of Greek columns. Then we compared them with the two the Romans added. Our kids also made “mosaics” using small pieces of colored paper cut into squares. Another day we compared the Science of Ancient Greece with the Science of Ancient Rome and made a chart showing the similarities and differences. Additionally during this unit one of my children built a volcano and we discussed Mt. Vesuvius. This is the volcano near modern day Naples that erupted in 79 AD, burying the city of Pompeii. And which is still considered one of the most dangerous volcanoes in the world, by the way. ? Continuing with our study… Our kids learned grammar and writing skills from copy work I chose from our literature and science books. They narrated from their independent reading, and my older student also completed written narrations. So what subjects did we integrate in this example? And which senses did we use? The sense “Feeling” at the end of the bulleted list above is one I bet you aren’t accustomed to seeing. But what our kids feel…the emotions they experience before and during learning… play a critical role in how effective that learning is. It’s logical that when children are anxious, overly stressed, depressed, angry, or fearful, there’s not going to be much learning taking place. But when children are relaxed, intrigued with the subject matter and/or teaching method, and looking forward to what they are going to be doing, learning is much easier. Recent brain research says that emotions can play an even more fascinating part in learning. Emotion has a substantial influence on the cognitive processes in humans, including perception, attention, learning, memory, reasoning, and problem solving. Emotion has a particularly strong influence on attention…as well as motivating action and behavior. Reference: Tyng, Chai M. et al. “The Influences of Emotion on Learning and Memory.” Frontiers in Psychology 8 (2017): 1454. PMC. Web. 28 June 2018. So how do you add strong emotion to a learning experience? Easily! By reading or hearing an exciting story with heroic characters, suspense, excitement, joy and sadness… by using a literature-based curriculum and choosing excellent children’s literature, your children will be riveted. Through a story, they’ll be immersed in a culture and time period in a way that a textbook can never match. How would you feel if you were (the protagonist/hero) of the story? Why do you think he/she acted that way? Would you have made that choice if you were in that situation? Why or why not? What was your favorite part of the story? How did it make you feel? If you were the author, would you have changed the story in any way? You can do this orally or you can have your students create reading response journals. Focusing on the emotional parts of the story by asking these kinds of questions helps your student put himself in the place of the main character, struggling to solve the situation he’s in. 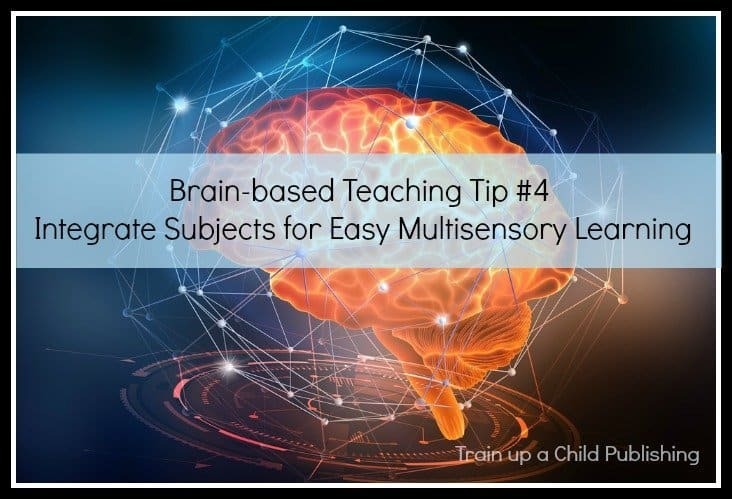 Remember the first post in this Brain-based Teaching Tips series? Do you remember the first post in this series? In it we talked about how critical it was to a student’s success that he believed in his ability to be successful. This is another example of how a strong emotion powerfully affects learning. So do you integrate subjects in your homeschool? Do you use different senses in your teaching? Tell me in the comments!